Activities include: Finding rhyming words in the story and then writing a poem using the words. Putting the way to make her brew in sequential order by cutting out strips of events, and drawing pictures of the different characters and objects and coloring them according to the descriptions in the story. This is a great activity for small groups. I love doing this project with my kids around Halloween! 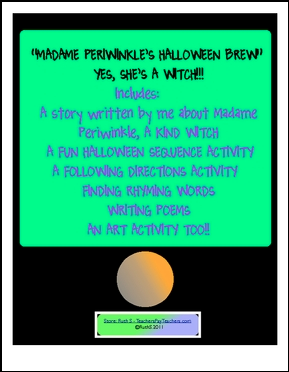 They have to read the story that I wrote about Madame Periwinkles Halloween Brew. Madame Periwinkle is a kind, old witch who loves to entertain her friends with Halloween cookies and her brew. Something happens in the story that requires the kids to help Madame Periwinkle. You will need colored pencils. Crayons are okay too! Scissors and orange, green, yellow or black construction paper, glue sticks. The Halloween template for their poems is included. Answers are included! I'm a teacher/author and offer Language Arts, Science, Social Studies, American History, Novel Packets, Grammar, Back to School, Holidays, Writing, Poetry, Spelling, Teacher forms products and more! Common Core Setting Comparisons Use with any book or story. Check out my snowball activities! Bloom Ball Reports Use with any fiction, nonfiction text or subject. Book Report Trifold Use with any novel. Fairy Tales Worksheet PacketFun! Imagine Cinderella's glass slipper is a sneaker and she arrives to the ball in a limo. Students love these activities! Idioms are Fun Packet Have a frog in your throat? Students don't seem to know what common idioms mean. They'll have fun discussing the literal and true meanings of them. Laminate these cards for future use.